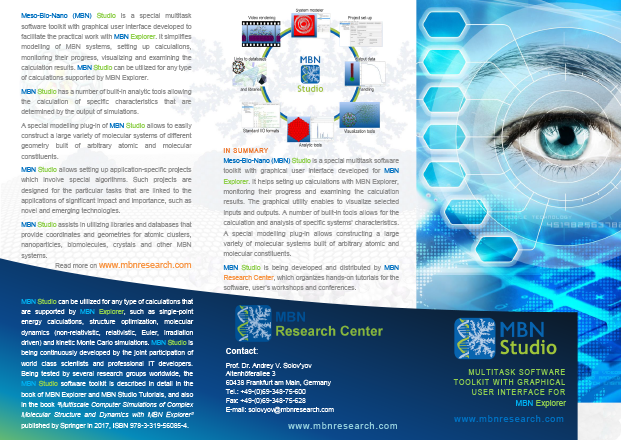 MBN Research Center develops the state-of-the-art scientific software – MBN Explorer and MBN Studio . 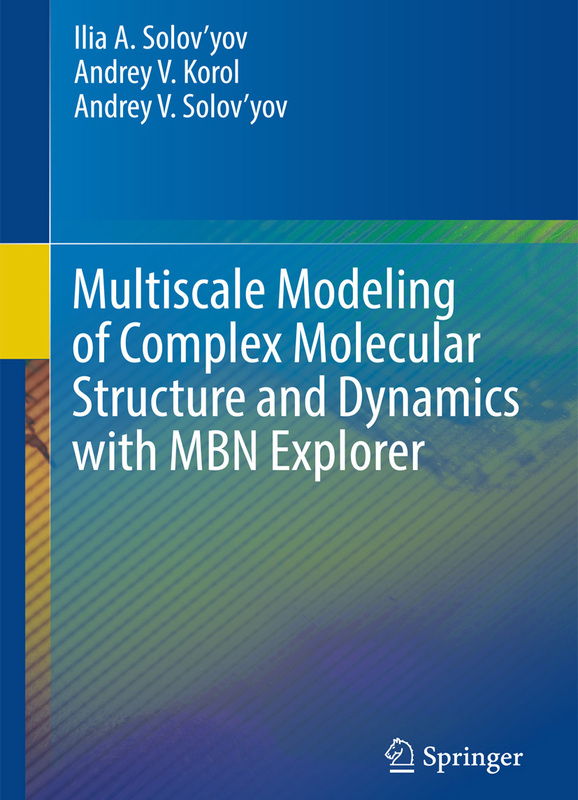 MBN Explorer is a powerful and universal software package for advanced multiscale simulations and modelling of complex molecular structures and dynamics. 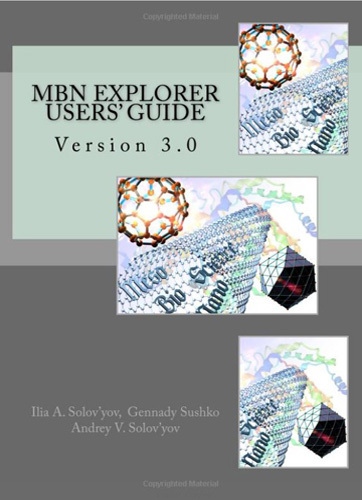 MBN Explorer has many unique features, a broad range of applications in Physics, Chemistry, Biology, Material Science, and Industries. MBN Studio is a professional graphical user interface for MBN Explorer that has been developed to facilitate setting up and starting the calculations, monitoring their progress, examining and visualisation of the results. MBN Research Center carries out a broad programme of frontier research exploiting the developed software. It is focused on the advanced computational research of complex molecular systems, such as biological and nanosystems, nanostructured and composite materials, their interfaces, properties, as well as processes with their involvement. A special attention is devoted to the development of multiscale approaches for quantitative description of MesoBioNano systems. MBN Research Center facilitates utilisation of high performance computing in the development of novel and emerging technologies. MBN Research Center participates in collaborative projects, organisers hands-on tutorials, training courses and conferences aiming at the promotion of its scientific knowledge and further development, validation, benchmarking, promotion and broad exploitation of its software. MBN Research Center maintains collaborative links with the Goethe University and many other Partners worldwide. It is located in Riedberg, a nice new district of Frankfurt am Main, at the Riedberg Campus of the Goethe University. The main office of MBN Research Center is based at the Frankfurt Innovation Center of Biotechnology GmbH. MBN Research Center develops the state-of-the-art software for advanced scientific research and computational modelling of molecular structure and dynamics of Meso-Bio-Nano (MBN) systems and takes efforts towards its wide distribution and exploitation. MBN Research Center carries out a broad programme of frontier research based on the utilisation of its universal and powerful software. It maintains cooperation with a large number of Partners worldwide, participates in collaborative research projects, organises thematic conferences. MBN Research Center offers hands-on tutorials for the software users, training courses in application of the software in different areas of academic and industrial research, advanced interdisciplinary courses on MBN Science and related areas of theoretical and computational physics. You are welcome to get in contact with the MBN Research Center team and to take advantage of its research & technological developments, and networking activities! 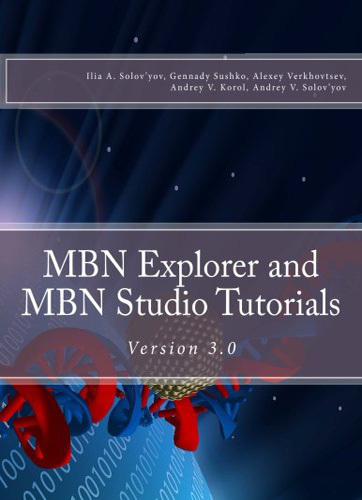 This Gallery highlights the selected Case Studies that have been conducted by the MBN Research Center team members with the use of MBN Explorer and MBN Studio. All these studies have been published in high impact journals and reported at the major international conferences. Images below are adapted from these publications. 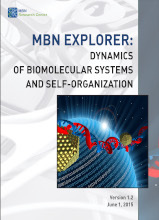 They represent numerous areas of application of MBN Explorer such as atomic clusters and nanoparticles; biomolecular systems; nanostructured and composite materials; hybrid molecular systems and material interfaces; material thermo-mechanical properties and related phenomena; dynamical molecular processes and multiscale phenomena; novel and emerging technologies. References to the respective publications can be found in section Publications. 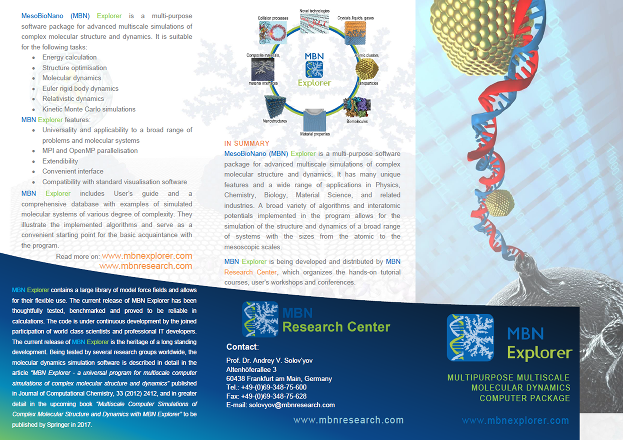 Below we provide the information materials about MBN Research Center, its software products and services, research, publications, teaching and knowledge dissemination activities. All the materials listed can be downloaded for free in PDF format. Take a look and contact us in the case of your interest.